Cubs Black Bear Statue Outdoor Garden Sculpture. 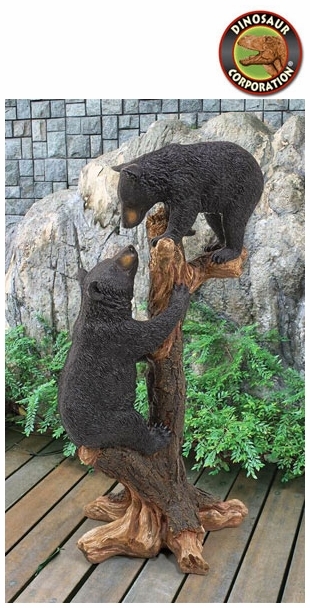 Scampering up a tree seems the ideal wilderness adventure for this playful pair of black bear cubs sculpted by artist Lightfoot. Though you'll still be tempted to give them a big bear hug, exclusive animal statue realistically portrays this dangerous duo with powerful paws and hungry predator enthusiasm. Intricately sculpted in quality designer resin, our bear sculpture is a yard-tall work of animal art that adds exacting detail with hand-painted realism for garden or gallery. * Size: 16�" W x 18" D x 36�" H.
* Top Cub Size: 13�" W x 6" D x 9"H.
* Bottom Cub Size: 10" W x 6" D x 18" H.